This seminal series, first edited by Ernest Eliel, responsible for some of the major advances in stereochemistry and the winner of the ACS Priestley Medal in 1996, provides coverage of the major developments of the field of stereochemistry. The scope of this series is broadly defined to encompass all fields of chemical and biological sciences that are founded on molecular and supramolecular interactions. Insofar as chemical, physical, and biological properties are determined by molecular shape and structure, the importance of stereochemistry is fundamental to and consequential for all natural sciences. Topics in Stereochemistry serves as a multidisciplinary series that enriches all of chemistry. 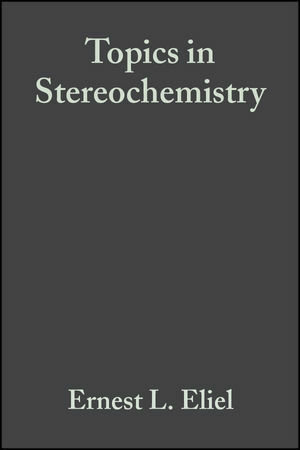 Aimed at advanced students, university professors and teachers as well as researchers in pharmaceutical, agricultural, biotechnological, polymer, materials, and fine chemical industries, Topics in Stereochemistry publishes definitive and scholarly reviews in stereochemistry and has long been recognized as the gold standard reference work in this field. Covering the effect of chirality on all aspects of molecular interaction from the fundamental physical chemical properties of molecules and their molecular physics to the application of chirality in new areas such as its applications in materials science, Topics in Stereochemistry explores a wide variety of properties, both physical and chemical of isomers with a view to their applications in a number of disciplines from biochemistry to materials science. ERNEST L. ELIEL is W. R. Kenan, Jr. Professor Emeritus at the University of North Carolina at Chapel Hill. He is the author of Stereochemistry of Carbon Compounds and Elements of Stereochemistry, coeditor of the Wiley series, Topics in Stereochemistry, and coauthor of Conformational Analysis. The recipient of numerous academic and scientific awards and honors, Professor Eliel is Past President of the American Chemical Society and a member of the National Academy of Sciences. SAMUEL H. WILEN is Professor of Chemistry at City College, City University of New York, where he has taught since 1957. Professor Wilen is the author of Tables of Resolving Agents and Optical Resolutions, coauthor of Enantiomers, Racemates and Resolutions, and coeditor of the Wiley series, Topics in Stereochemistry. A Link Between Macroscopic Phenomena and Molecular Chirality: Crystals as Probes for The Direct Assignment of Absolute Configuration of Chiral Crystals (L. Addadi, et al.). Asymmetric Catalysis by Alkaloids (H. Wynberg). Stereochemistry and Organic Solid-State Reactions (B. S. Green & M D Cohen). Substituent Effects on 13c Chemical Shifts in Aliphatic Molecular Systems: Dependence on Constitution and Stereochemistry (H. Duddeck).